Gummy bears are a timeless treat that most of us have enjoyed from childhood. Now that we’re all grown up, it only makes sense to enjoy a more mature version of this popular candy. Enter; cannabis gummies! Homemade cannabis gummies are a great way to enjoy the benefits of cannabis whenever, wherever, and without having to deal with the slack that people will give you when you’re smoking a joint. The best part is that you can make your own all-natural cannabis-infused gummies at home. But first, let’s take a look at why cannabis-infused gummy bears are so awesome. While we can’t deny that store-bought gummies are convenient and delicious, it’s also true that they’re packed with artificial flavors and additives that are harmful to your health. Homemade gummy bears, on the other hand, are not only more flavorsome and beautifully textured in comparison, but they feature wholesome natural ingredients that are good for you including fresh fruit and medical cannabis. Plus, you can easily store homemade gummies and keep them fresh without the use of nasty preservatives. All you have to do is coat them in some sugar so that they don’t stick together and keep them in the fridge until you’re ready to eat them again. You’ll also find that it’s much easier to stick with your recommended dosage of medical marijuana when you’re consuming it through cannabis gummy molds. All you need to do is keep track of how many gummy bears your need each time and you’re good to go. 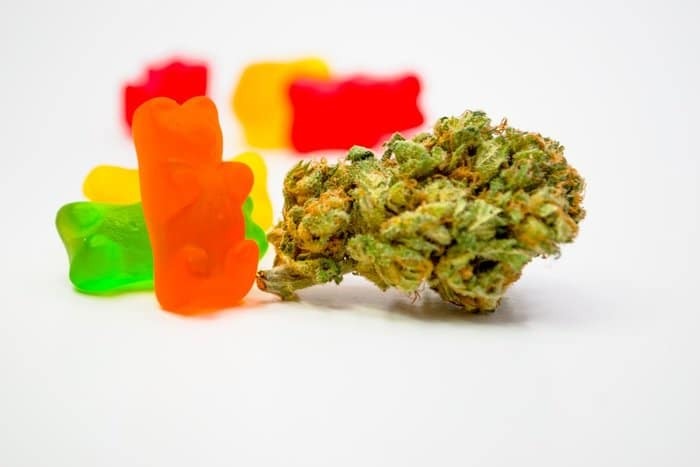 However, the best part about gummy bears is that they actually enable the cannabis to quickly absorb into your bloodstream so that you can feel the beneficial effects quickly after consumption. The first step to preparing homemade gummy bears is to prepare the marijuana first so that it’s psychoactive. This is done through a process that’s known as decarboxylation, which is just a fancy word for heating up the plant just enough to get rid of the carboxyl atom from the THCa chemical. To do this, simply spread the ground cannabis onto a sheet of parchment paper which has been placed on a baking pan. Then, place the pan into an oven which has been preheated at 240 degrees and leave it in there for 60 minutes. After you’ve taken the cannabis out, make the tincture that you’ll use when cooking and/or baking by soaking your decarboxylated cannabis into a food-grade alcohol liquid for a few hours. Make sure you shake the liquid vigorously every couple of minutes so that everything is properly infused. There you go! Your very own homemade cannabis-infused gummy bears to enjoy whenever you like! Previous PostPrevious How to Make a Gravity Bong?